My blog turinmamma.com/ is currently undergoing a facelift and, as part of the changes, it will be a self-hosted site. When my new site goes live (the address, turinmamma.com/ will remain the same) to continue to receive post updates to your email, you’ll need to subscribe to receive email notifications again. WordPress.com bloggers should also subscribe to receive news feed notifications once again. Simply look for the Follow Me Via Email box or the RSS icon on my new site. I do hope you will continue to follow as there are exciting times ahead. In September, I will start a professional culinary course at l’Associazione Cuochi di Torino. During the same month, I will also start taking part in a new monthly blogging roundtable with a group of Italian food bloggers I’ve been lucky enough to ‘meet’ and connect with online. I’m looking forward to sharing more recipes and food stories from my kitchen in Turin with you very soon. I have a confession to make. Unless I’m baking or recipe-testing for this blog, I don’t always take out my kitchen scales to check how much an ingredient weighs. And I don’t think I am alone in this approach either. Many Italian-language recipes feature informal measuring units such as manciate (‘handfuls’), bicchieri (‘drinking glasses’) pugni (‘fistfuls’), ciuffi (‘clumps’) and pizzichi (‘pinches’). Some older recipe compendiums may not feature any approximate indications at all, like Giuseppe Chioni’s remarkable prison-camp penned Arte culinaria. Many Italian cooks simply assume that their observers or readers will have the taste and instincts necessary to gauge the right quantity or quanto basta, meaning ‘how much is enough’ or ‘to taste’. Bagnet verd (the Piedmontese name for salsa verde or ‘green sauce’) is easily made according to the q.b. philosophy. This herbaceous sauce, which has a recorded history going back to the Middle Ages, lends itself perfectly to ditching grams and putting whatever herbs, alliums, thickener and acidic liquid you have on hand (or fancy) in it. In The Medieval Kitchen, Reddon, Sabban and Serventi provide us a recipe from the period which includes soaked stale bread, parsley, sage, pepper, cloves, nutmeg, cinnamon, powdered ginger, garlic and vinegar. Then there’s Bartolomeo Scappi, ‘secret’ cook to popes and author of the seminal Renaissance cookbook Opera with a distinctly less spicier version. He prepared his with parsley, spinach tips, sorrel, burnet, rocket, mint, pepper, sugar, vinegar and the optional pesto-like touch of crushed almonds or hazelnuts. In the 19th century, Giovanni Vialardi and Pellegrino Artusi did away with any remaining hint of sweetness and went for meatier umami by adding crushed boiled egg yolks, capers and anchovies to their bagnetti. Artusi, interestingly enough, suggests using capsicums in the absence of capers. Beppe Lodi and Giovanni Goria, authors of two classic 20th century Piedmontese recipe books, gave this zesty preparation even more piquancy by including a spagnolino, their amusing word (it literally means ‘little Spanish thing’) for a dried red chilli pepper, in their interpretations too. My version is a compromise between TP’s tastes, my tastes and whatever we have available in season and at home. Sorry purists, but TP and I are not crazy about raw garlic (unless it’s fresh) so it’s been removed in favour of a spring onion. This should be chopped finely and left to soak in vinegar for at least an hour. TP has also had a rather strange phobia of boiled eggs since he was a child so I tend to opt for a large slice of leftover bread (of which we have plenty and I am loathe to waste!) soaked in vinegar as a thickener instead. When it’s in season, I also can’t resist adding a heaped fistful of basil leaves to two already generous bunches of parsley. I use salt-packed capers and anchovies so I find that there is no need for salt ‘to taste’ either. To reduce all these ingredients to small pieces, I prefer the coarser finish of chopping them with a mezzaluna, that wonderful two-handled crescent-shaped knife my mother-in-law and other Italian home cooks swear by. I won’t balk at the quicker more homogenised result of a food processor though when pressed for time. At any rate, the ‘recipe’ below is not prescriptive at all, merely a set of guidelines. Basically, don’t be afraid to adjust quantities, add/omit ingredients and vary the preparation method to your tastes and means. That’s what quanto basta is all about! In Piedmont, bagnet verd is one of the seven sauces that traditionally accompanies the seven cuts of boiled meat, the seven boiled ‘garnishes’ (mostly offal and extremities) and the three side dishes all comprising the Gran bollito misto. A less ambitious but no less traditional alternative to this component-rich ‘boiled dinner’ is to prepare some lingua lessa or boiled tongue to go with your zesty bagnetto. Offal not your thing? Then use it give some plain grilled fish, meat or chicken some zing. Looking for a vegetarian option? Simply remove the anchovies from the ‘non-recipe’ below and dress some oven-roasted capsicums or boiled potatoes with it instead. Love cheese? Use it as a topping on some soft cheese rounds, like the Piedmontese often do with their tomini. Its peppery flavour also works well on a simple slice of bread and, surprisingly enough, pizza. White or red wine vinegar, q.b. Drain chopped spring onion and bread of any excess vinegar in a colander. Chop soaked bread into fine pieces. Add onion and chopped bread to a bowl. Drain capers and anchovy fillets on plate lined with paper towels. Split the anchovies into two and pull out their spines. Chop anchovy fillets and capers very finely with a good knife or mezzaluna. Add to bowl with the chopped onion and bread. Remove thicker stems from the parsley and chop very finely along with the basil leaves. Add to bowl and mix ingredients until well-combined. Add olive oil in a slow steady stream and stir continuously until you have a dense sauce. Marco Polo discovered pasta at Kublai Khan’s court in China and brought it back to Europe. Catherine de Medici brought forks, artichokes, peas, asparagus, broccoli, truffles and sorbets to France and changed the way her adopted country ate and cooked forever. In the 1600s, the frail crown duke of Savoy was cured of his ailments by breadsticks. Tiramisù was invented as a ‘pick me up’ for courtesans in the 17th century. These are just some of the stories or myths Italians are fond of narrating about foods and recipes from their country. Historians may frown upon the practise but even Gillian Riley, who gives Catherine de Medici and the food myths surrounding her a thorough demolition job in The Oxford Companion to Italian Food, concedes that these anecdotes bring a human touch to the plain facts. Its legends like these that demonstrate how much Italians care about ingredients and cooking. The creation myths surrounding farinata, an unleavened oven-baked flatbread made of chickpea flour, are some of my favourites. There’s one which traces its origins as far back as Ancient Greece and Rome. Soldiers in need of a quick and cheap meal would prepare a batter of chickpea flour and water which they would then cook on their metal shields out in the hot sun. The other is about a chance discovery by Genoese sailors after the maritime republic defeated its archrival Pisa in the Battle of Meloria in 1284. On their return journey, the Genoese ships were hit by a storm. The ships’ provisions of oil and chickpea flour were overturned and soaked with salt water. The sailors’ supplies were limited, leaving them little choice but to eat bowls of salty chickpea paste. Some of the sailors refused to eat this paste and left their bowls out on the deck exposed to the sun. The sun-baked mixture was found to be more palatable. Once they were back on dry land, the sailors perfected the batter and baked it in an oven. They called this oven-baked pancake l’oro di Pisa (Pisan gold), in mockery of the defeated Pisans. Naturally, there is little basis in fact to prove these legends. However, most people agree that farinata originated in Genoa. And it was from this port city – one of the great seafaring powers of the Mediterranean during the Middle Ages and early Renaissance – that this flatbread went on to be introduced to regions within the maritime republic’s sphere of influence. Look out for socca along the Cote d’Azur in France, cecina or torta di ceci along the Tuscan coast, fainè in northern Sardinia and belecauda in the southeast of Piedmont. The names may change but the essential ingredients (chickpea flour, water, salt and olive oil) and method for making them are identical. 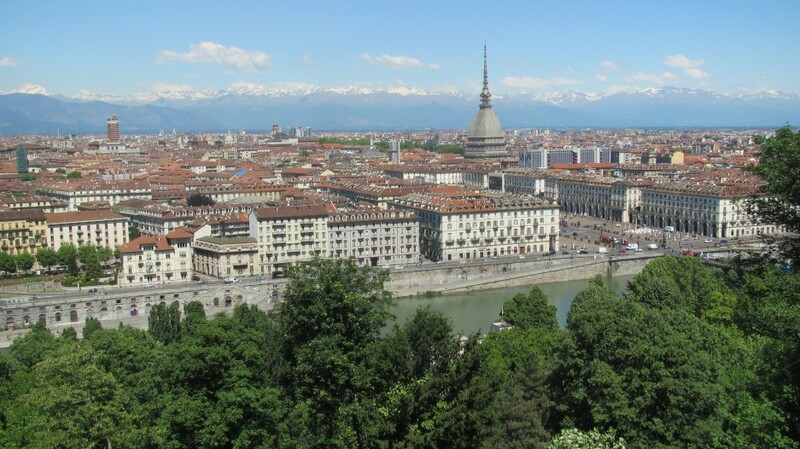 Turin has also adopted farinata as its own. In fact, a slice of this nutritionally-dense pancake was my meal of choice when I first moved to the city and was commuting between companies as an English teacher. Like those weary soldiers from Antiquity, I didn’t always have time for a sit-down lunch and often went to the closest panificio to buy a bread roll and some farinata, for a quick and filling lunch-to-go. Put chickpea flour and salt in mixing bowl. Add water in a slow and steady stream to avoid forming lumps. Whisk until batter is smooth. Leave batter to rest for a couple of hours. Pre-heat oven to 225 degrees. Pour olive oil into baking tray ensuring that the base is covered. Pour farinata batter onto tray. Stir batter and olive oil so they are evenly distributed. The batter should be about 3-4 mm high. Bake for about 20 minutes or until farinata has begun to pull away from the edges of the baking tray and has formed a nice golden crust on top. Slice farinata and serve hot with some freshly ground black pepper on top. Buon appetito! [i] If a copper tray is not in your budget, the next best material to use would be the specially treated steel Italians call ferro blu, followed by aluminium and non-stick. If using these materials, the baking time will be longer (around 25-30 minutes). N.B. All links to products I’ve just made are entirely non-sponsored! No, I haven’t suddenly realised the errors of my ways after advocating the consumption of offal in my previous post and gone vegan or dairy-free. My motto is, and always will be, all foods are fine (unless you have a valid health reason obviously!) in moderation. Basically, it’s another case of intending to post about something (in this case, a Sicilian dessert) which calls for this plant-based milk and then realising this milk itself deserves its own post. An aromatic and satisfying drink, almond milk also has a long and interesting history as a cooking staple. Scappi added flour starch, a thickener and not a coagulant, such as rennet, vinegar or lemon juice, to his almond milk. So, technically speaking, this ricotta is really a set dessert or pudding made to look like the aforementioned whey cheese. These days, almond milk is the key ingredient in a Sicilian pudding I’m quite fond of, biancomangiare. This concoction, meaning ‘white food’, appears to have originated in medieval monasteries. Its ancestor dish, which was popular with convalescing aristocrats and people on the pilgrim route all over Europe, was made with a typically of the time agrodolce or sweet-sour mix of almonds or almond milk, shredded capon or chicken breasts, spices and sugar. After the Renaissance, Italian and other European aristocrats’ enthusiasm for liberally adding sugar and spices to otherwise savoury foods waned. The contemporary version is completely sweet and is generally made with almond milk, cream[ii] and sugar thickened with cornstarch or gelatin. I never ended up making biancomangiare. After an almost twenty-four hour period of soaking almonds, removing their skins, grinding, pureeing and finally, filtering, I was curious to try the fruits of my labours. I poured the resulting milk into a glass. It was more watery than the full cream cow’s milk I’m used to drinking. It had body though and the drupe’s[iii] distinct aroma. I kept refilling my glass until I no longer had enough of the restorative liquid for making the silken white pudding I had been so keen to try. I’ve made almond milk at least five times for purely drinking purposes since. Italian supermarkets and health food shops are full of cartons of ready-made almond milk. Here, there are also condensed syrups, powders and pastes for making latte di mandorla. In theory, they make the soaking, blanching and all the other hard work involved obsolete. I‘m certain though you’ll be more satisfied with the results when preparing the almonds yourself. Not only will you understand the principles behind the extraction process better, you’ll also know exactly what ingredients have been put in it. Those almond milk cartons and pre–prepared mixes often contain sugar (I prefer my milk unsweetened) and unnecessary additives. I won’t lie, you’ll need to plan ahead when making your own almond milk from scratch. After soaking the almonds overnight, set aside at least an hour to remove their wrinkled skins. Maybe you could enlist another set of nimble fingers for this rather slippery and painstaking task too! You’ll also need a muslin cheesecloth, a nut milk bag or a very fine mesh sieve for filtering the almond puree. The following method for preparing almond milk was adapted from the Italian eco-food blogger Lisa Casali’s book Autoproduzione in cucina. Please note that the quantities of water (1 litre) and almonds (300 grams) I’ve indicated are changeable. For this reason, it’s not a strict recipe. It’s the method that counts! If you prefer a watery milk, simply decrease the amount of almonds or add more water. Want a denser and richer milk? Add more almonds or lessen the amount of water. You could also add 3-4 bitter almonds or apricot kernels[iv] to your mixture for extra flavour. Don’t add any more though as they naturally contain trace amounts of cyanide and consuming them raw in large quantities is poisonous. Soak almonds and (if using) apricot kernels in cold water overnight. Remove skins from almonds and lay them on a clean tea towel to dry. Grind almonds in a food processor while adding water in a steady stream until you get a puree. Leave almond puree in refrigerator to infuse for 2-3 hours. Line a colander with several layers of muslin cheesecloth and pour the puree through the lined colander. Using the back of a large spoon, press the pulp[v] that has accumulated inside the colander to extract as much liquid as possible. Transfer milk to a bottle, cover and store in refrigerator. Best consumed within three days. [ii] Some versions use almond milk exclusively though. [iii] Almonds are actually a drupe and not a true nut. They belong to the prunus genus like cherries, peaches and apricots. [iv] In Italy, these are used to make the liqueur Amaretto and in amaretti biscuits. [v] Don’t throw away that pulp! Here’s a link to a recipe from our friend Pellegrino Artusi for making sure it does not go to waste. I was a very picky eater growing up. There were so many things that I wouldn’t touch then. Fish (with the rather curious exception of fish fingers and canned tuna), onions, butter, anything leafy and green. I think I may have refused to eat eggplants at some point too. Then there was tripe. I would strategically move these strips of stomach lining to the side of my bowl so I could enjoy the otherwise delicious tomato, beef and potato-based stew my mother often prepared this ingredient in. As I grew up and travelled, my palate widened significantly. I eat all fish now. I love onion-based dishes like French soupe à l’onion and this Piedmontese gem I recently posted about. With all the cakes and tarts I like to make, I probably use too much butter now as well! I’ve become obsessed with eating crudités and my favourite way of getting my almost daily fix of these is with a bowl of raw green leaves dressed in olive oil, vinegar and salt. In summer, I probably use eggplants in some way at least every second day. Until a recent trip to Rome though, I refused to give tripe another chance. Somehow, I don’t think I was alone in my dislike of tripe. I’ve seen many people wrinkle their noses at the mere mention of the word. Since taking the plunge and eating a plateful of trippa alla romana last October though, I’ve been pondering a few questions based on what University of Pennsylvania Psychology professor Paul Rozin has to say about food preferences, distaste and disgust. Was my dislike of tripe sensory? Did I refuse to eat it because of its taste? Or, was my dislike conceptual? Did I reject it because I was revolted by the idea of eating it? Looking back, I suspect my dislike was conceptual. Rozin has found that almost all things causing disgust are of animal origin. Consuming animal organs may just remind us a little too much of bodily functions, our animal nature and, most frighteningly of all, our own mortality. At some point as a child, I probably picked up that I was supposed to be disgusted by cows’ guts. According to Rozin, the best way of overcoming both sensory distaste and conceptual disgust is exposing ourselves to the food in question. So, since trying that admittedly wonderful tripe simmered in tomato and seasoned with mint and pecorino in Rome, I’ve been making the effort to ‘re-educate’ my tastes through research about and cooking with it. Surprised by his response, I went back home and checked the recipe for trippa alla fiorentina I’d been given to test for this lovely lady’s upcoming cookbook. I then sent an sms to Paolo confirming that I needed a mix of croce (blanket tripe) and cuffia (honeycomb tripe) without really knowing what they meant. Later, I would learn that there are four types of tripe in total, all corresponding to the four chambers of a cow’s stomach: rumine or rumen (blanket) tripe; reticolo or reticulum (honeycomb) tripe; omaso or omasum (book tripe); abomaso or abomasum (reed) tripe. Delighted with the results at cooking with blanket and honeycomb tripe Florentine-style, I tried my hand at making trippa lampredotto in zimino, another Tuscan dish made with reed tripe and chard. I also couldn’t help but check what my stovetop companion Artusi had to say about trippa. Surprisingly enough for an adopted Florentine, the author of Science in the Kitchen and the Art of Eating Well was not fond of tripe. He famously declared in his first of three lone tripe recipes, ‘No matter how it’s cooked and flavoured, tripe is an ordinary dish.’ In his opinion, only the milanesi were capable of making it ‘light and tender’. Its digestive effects, moreover, were undesirable for those with ‘weak stomachs’. His polpette di trippa (‘tripe meatballs’) on the other hand, adapted from Antonio Latini’s 1694 recipe in Lo scalco alla moderna (The Modern Steward), were ‘quite pleasant … when prepared with the right seasonings’ and would not ‘lie heavily on the stomach’. Personally, I had no problems digesting any of the tripe dishes I made (even the ones that Artusi claimed lie heavily on our stomachi). For anyone new to eating tripe though, I think his polpette di trippa are the way to go initially, with their familiar meatball-like shape and consistency. I’ve seasoned mine with parsley and nutmeg like Artusi, but other herbs and spices could work well too. You’ll also need to check with your butcher if the honeycomb tripe you’ve bought has been cleaned and pre-cooked. The recipe below, inspired by Artusi’s and Emiko Davies’, includes instructions for pre-boiling should you purchase tripe that requires pre-boiling. Wash tripe in warm running water, drain it and place it in a large saucepan with a peeled onion. Cover with water and boil for 1 hour or until tender. While cooking, ensure that the tripe sufficiently covered with water. When cooked, drain tripe, rinse it thoroughly and leave it to cool. Mince cooled tripe and ham finely in a food processor. Add the egg, cheese, 2 tablespoons of breadcrumbs, parsley, nutmeg and salt and mix until all the ingredients are well-combined. Put three bowls on your work surface and add flour to the first one, olive oil to the second one and the breadcrumbs to the third one. Using your hands, form 20-25 small balls (they should have a diameter of about 3.5 to 4 centimetres) with the tripe mixture. Dip and roll each ball in the bowl with the flour, followed by the bowl with the olive oil and finally, the bowl with the breadcrumbs. While rolling the balls, ensure that their surfaces are evenly coated. Heat vegetable oil in a saucepan until the temperature is 170 degrees. Fry four polpette at a time for 1 and a half minutes or until evenly crisp and golden brown. Remove polpette with a slotted spoon onto a plate covered with absorbent paper towels. Serve hot as an antipasto, alongside platefuls of olives and sliced prosciutto. The post Saturday tripe was inspired by the Roman saying: Giovedì gnocchi, venerdì pesce, sabato trippa (‘Thursday gnocchi, Friday fish, Saturday tripe’). This post concludes my trilogy about the three foods. My intention was actually to post about a rich ricotta-filled baked good for Easter. Think Neapolitan pastiera, Sicilian cassata or Giovanni Goria’s crostata di seirass[i]. The resolve to make these wonderfully elaborate sweets disappeared fairly quickly though thanks in great part to my husband’s love of a simpler, dare I say it, ‘homier’ dessert requiring pasta frolla or sweet shortcrust pastry. Early last month, TP caught me dusting my kitchen work bench with flour. His automatic assumption – the sweet, buttery dough I was about to knead was for a jam tart or, as it is called in Italian, crostata di marmellata. I didn’t want to disappoint him. Luckily enough, there actually happened to be a jar of plum jam in our pantry. The ricotta I had especially bought was put to another (savoury) culinary use that evening. History buff that I am, I wasn’t disappointed either when it came to researching the crostata’s past, which appears to go back to the Renaissance. Bartolomeo Scappi, ‘secret’ cook to Pope Pius IV, included several recipes for pastry-based dishes in his 1570 cookbook Opera. Incidentally, Scappi’s seminal work is notable for, among many other things, being the first in depth look at pastry-making. He used the term crostata for a variety of flaky dough-encrusted preparations. Fillings included cheese, crabmeat, prawns, pork jowls, artichokes, cardoon hearts, truffles, sweetbreads, calf’s tongue, ‘the viscera[iv] of any sort of turtle’, plums, sour cherries, quinces and pears. Sugar and spices were liberally added to these ripieni or fillings, an inheritance of medieval culinary customs. The plain friable dough that Scappi used to encase his fillings has since given way to the crumblier and sweeter pasta frolla. Essential to obtaining a good frolla is a half fat to flour ratio, the use of cold butter (or other cooking fat) and the thorough combination of these two with a finely ground sugar before adding any eggs. Artusi has three recipes for making it which all match these criteria. Since lard is rather difficult to come across these days (his first and third recipes include lard)[v], I’ve always used his second recipe which is made with butter. The addition of grated lemon zest is my own. Otherwise, everything else about the following crostata di marmellata recipe I owe to the avuncular and eccentric author of Science in the Kitchen and the Art of Eating Well. Remove dough from fridge. On a clean, flour-dusted work surface, roll out about two thirds of the ball to cover a greased and dusted baking dish (I used a dish with a 26 cm diameter and a depth of 3cm). The dough should be about 3mm thick. Use a pastry wheel or knife to remove any overhanging dough. Fill the crostata with jam. Roll out the remaining dough and, with a pastry wheel or knife, cut long strips with a width of 1.5cm. Place strips in a criss-crossed fashion on top to create the lattice. [vii] If you like, you may wish to try your hand at interweaving the strips like this clever lady here! Bake at 180 degrees Celsius for 30 minutes or until the crostata is golden brown and its crust has begun to pull away from the edges of the baking dish. [i] Seirass is the name for a delicious Piedmontese variety of ricotta which has creamy, smooth consistency. [ii] The Italian word for ‘window displays’. [iii] The Italian word for ‘strips’. [iv] an archaic word for the organs in an animal’s abdominal cavity. Scappi was a big fan of cooking offal and extremities. Stay tuned for a recipe and some reflections on nose-to-tail eating later on this month! [v] Despite what many a ‘Mediterranean diet’ guru would have us believe, lard was the most commonly used cooking fat in Italy until the post WWII period. Olive oil was actually used very sparingly and reserved for lean days and periods (such as Lent) and butter was a luxury item. [vi]Like Artusi, I’d recommend not being in a rush and waiting longer, overnight even! [vii] I always find I have a little bit of leftover dough with the baking dish I use. Solution: I get my cookie cutters out and make biscuits (there’s usually enough for about four) with whatever remains! © Turin Mamma, 2016. Unauthorised use/and or duplication of site contents without permission from the author is prohibited. Basically, if you would like to use recipes, excerpts or photos, you must give full credit to your source! By using this site, you automatically agree to abide by these terms.